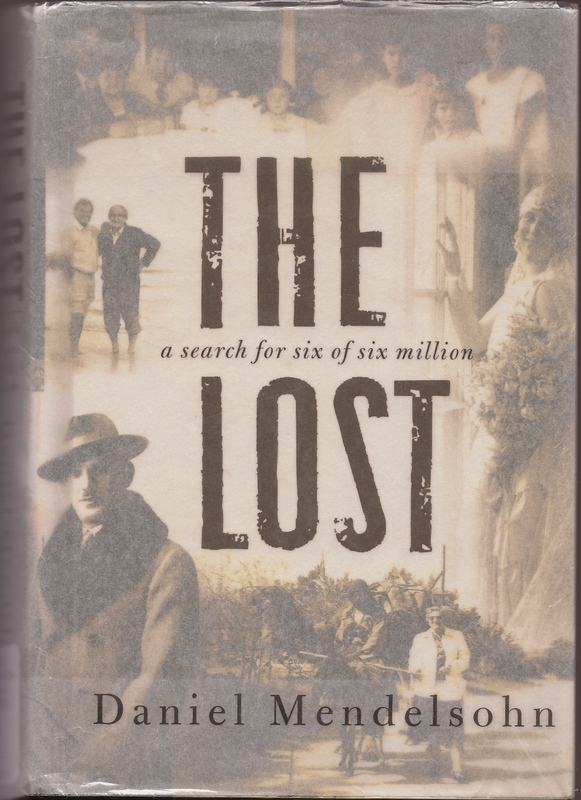 This week, I finished a remarkable book: Daniel Mendelsohn’s The Lost: A Search for Six of Six Million. A conversation with a friend who was reading it brought it to my attention; then I remembered the positive reviews it got when it was published in 2006. Mendelsohn grew up entranced by his grandfather’s stories. He also heard, though usually in whispers, in Yiddish, and without any details, about his grandfather’s brother Shmiel, who stayed in the Ukrainian town of Bolechow instead of getting to Israel or America as others in the family, and who, along with his wife and four daughters, perished in the Holocaust. Eventually Mendelsohn began to seek for those details, and in the process of many years and much research, interviewing, and travel, was able to put together something of a story of who these six were and how they died. Their tragic fates were the fates of six million Jews and others considered “undesirables” — death; this is a Holocaust book. But it’s much more. It’s Mendelsohn’s quest, complete with twists and turns, and his descriptions of it are multi-layered, and reflective. One tiny example: he notices that one of the elderly people he interviews always uses the word “perished” to described what happened to Shmiel and his family (as I did above, because of the book) and notices the resonances of that word compared to others he might have used such as “died” or “were killed.” The book is rich in observations like this, and on themes such as the unreliability of memory and rumour, on facts versus judgment, on the nature of stories and storytelling. Sometimes the stories we tell are narratives of what happened; sometimes, they are the image of what we wish had happened, the unconscious justifications of the lives we’ve ended up living. Mendelsohn also weaves in the Torah’s opening stories, from Creation through Abraham’s offering of his son Isaac, drawing especially on the commentaries of Rabbis ben Itzhak (also known as Rashi) and Friedman. When it comes to parallels with the Cain and Abel story, for example, there’s more sibling failure in his grandfather’s family than his grandfather’s stories revealed, and failure in his own. (In fact, he says, the Cain and Abel story will be “eerily familiar” to anyone who has a family — which is everyone.) When he was a boy he broke his brother’s arm in a fit of jealousy and rage. Now, though, perhaps ironically, this “lost” brother is the one who travels with him and takes the photographs, and becomes, Mendelsohn says, “the greatest treasure” he finds in his search. The Lost is a big book, sprawling, sometimes sentimental (Mendelsohn admits he’s sentimental), sometimes sad, but beautifully written, one of those books you come to the end of and feel grateful to have read. This entry was posted in Books and tagged Daniel Mendelsohn, sibling rivalry, storytelling, The Lost: A Search for Six of Six Million by doradueck. Bookmark the permalink.